Uncover Siwa desert after breakfast in hotel, start at the village of Abu Ali then cross to the Great Siwa Mountain to check first human footprint over the mountain is dating back to the to prehistoric era. Continue to the fossils area to explore the rocky coral reef dates back to the Cambrian era then drive to the spring eyes of Shiata Lake. Enjoy the sand surfing in the desert before swimming in the cold spring relaxing atmosphere. Transfer to the hot spring for chill and tranquilize your Muscles and end the day admiring the Sunset with Bedouin Tea & overnight camping in Bir Wahid. 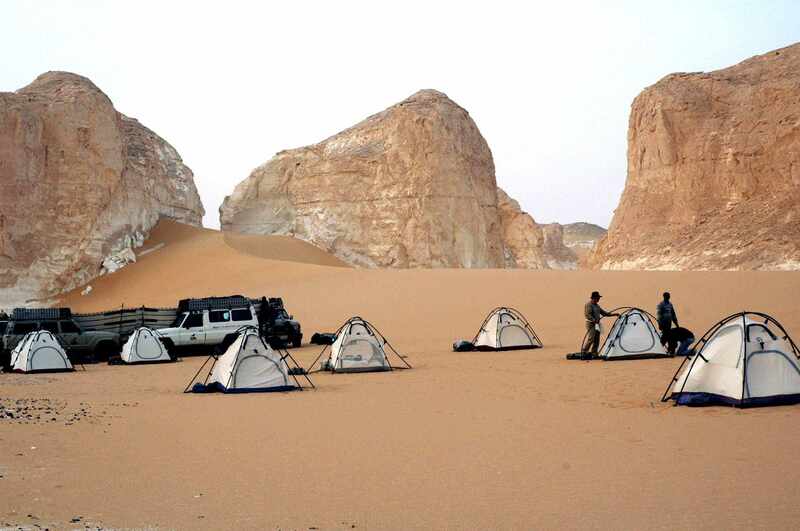 Breakfast and continue crossing the Western Desert, Lunch break and arrive to the White Desert. Dinner and camping overnight. Enjoy walking around the old village of Bahariya oasis to wander palms & fruit trees. Then move to the Black Mountains, explore the sand dunes and the salt lake then Continue to visit the Temple of Ain El Muftella and watch the the ruins ‘the English House’. Visit the Black Desert, Crystal Mountain, El Haize & Agabat Vallies Dinner with Bedouin entertainment & overnight.